» CourtVision: Is This What Carmelo Anthony’s Prime Looks Like? CourtVision: Is This What Carmelo Anthony’s Prime Looks Like? When NBA superstars are 28 years old, they’re supposed to be in their prime. Michael Jordan won his first title when he was 28. LeBron is 27 and is clearly playing better than ever. Carmelo Anthony turned 28 in May. He spent part of the summer in London, and as the second leading scorer on Team USA, reminded us that he’s more than capable of playing alongside LeBron, Durant, or anyone else. The problem is, we needed that reminder. Carmelo Anthony is a great player, but his numbers suggest decline at the stage when most superstars peak. Last season, many of his key indicators raised red flags. He shot 43 percent from the floor — the worst figure since his rookie season nine years ago. He also averaged the fewest free throws per game since his rookie season — only 6.7 per game. His rebounding was at its lowest level since 2006-07. These three indicators don’t just suggest that Carmelo had a bad year last year; they also imply why — he’s not spending enough time near the basket. There are three clear clusters of activity in Carmelo Anthony’s offensive game: near the basket, on his right in the mid-range, and behind the arc along the right wing. About 2/3 of his field goal attempts come from these three zones. His shooting tendencies are very asymmetrical and very concentrated. This is not unusual nor is it problematic in itself; LeBron (who Carmelo will play Friday night in the Knicks season opener) exhibits a similar level of asymmetry on the other side, and that seems to be going OK. But Carmelo could actually learn from LeBron by recognizing that he helps his team most near the rim, where he can score in ways that Steve Novak can’t. Close-range Carmelo is the best Carmelo, but as LeBron has revolutionized his game with a migration toward the post, Carmelo seems to be moving the other way. Last season Carmelo shot only 43 percent, down 6 percent from his career peak in 2008, but that dip can be misleading. It’s not as though Carmelo has become a poorer shooter since 2008. The difference is a fairly significant shift in his spatial shooting tendencies; he’s getting fewer close-range shots and replacing them with less-efficient jump shots. 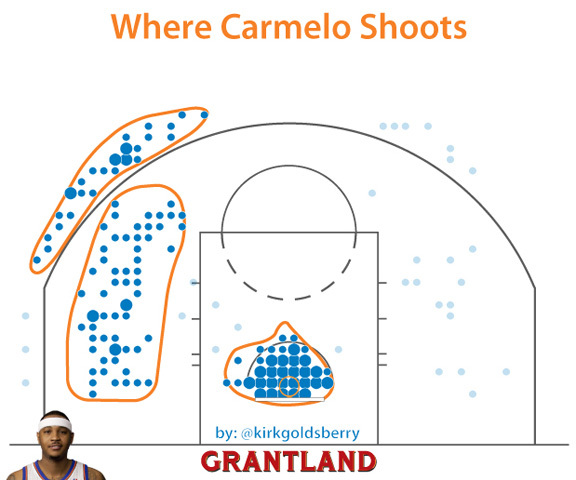 Carmelo’s field goal percentage is just as much a reflection of where he’s shooting as it is of how well he is shooting. Last season Carmelo attempted 37 percent of his shots in close-range situations; he made those shots 57 percent of the time. Between 2007 and 2011 he attempted 43 percent of his shots in this zone, meaning that since 2007-08, his field goal percentage and close-range shooting frequency have dropped an identical amount. This is not a coincidence. This kind of stark decline in close-range opportunities would not be unusual for an NBA forward in his mid-30s, but for Carmelo, it’s come a decade too soon. As Melo’s close range should be getting nastier, he’s settling for more jump shots. Although Anthony is a decent NBA jump shooter, it’s hard to justify the number of jump shots he’s taking. Last season, he shot 442 mid-range shots; he made 38 percent, which is almost identical to the league average. That doesn’t deter him from taking them. In fact, over the past two seasons the only other player who has shot as much as Anthony in his favorite mid-range cluster is Dirk Nowitzki, who has made 51.7 percent of those shots. Is it fair to compare Carmelo to Dirk? Maybe not, but they are the only two players to shoot more than 400 times from this area over the past two seasons. It’s hard to justify that comparable value without a corresponding level of efficiency. In fact, out of the 21 players who have attempted at least 200 shots from this zone over the past two seasons, Carmelo ranks 14th in efficiency. Carmelo may be an elite scorer, but he is not an elite mid-range shooter. This may be the root of what irks Knicks fans about modern-day Melo. If there’s a problem with Melo’s game it’s that he’s too active there, and not active enough in the post and near the rim. This isn’t entirely his fault; schemes, sets, and personnel are also to blame. Regardless, nearly every mid-range shot he takes is a misplaced opportunity. In the same way that a Steve Novak floater is less optimal than a Steve Novak 3-pointer, a Carmelo mid-range jumper is less optimal than a Carmelo post move. In fairness to Carmelo, one reason LeBron was able to migrate toward the block last year is because there was space for him to do so. There is no Tyson Chandler on his team. There is no Amar’e Stoudemire on his team. On a team with two knights already on the board, Carmelo is almost forced into playing more like a bishop. With Stoudemire out for the first six weeks of the season, it will be fascinating to watch Carmelo operate.